How to choose the size of your bike ? The size of the bike is defined according to each person, it is an essential choice for the practice of your activity. It depends on your stature (S), your crotch (E) and your type of bike. These different parameters determine the height of the frame (H). Do not hesitate to contact your dealer to find the one that suits you ! 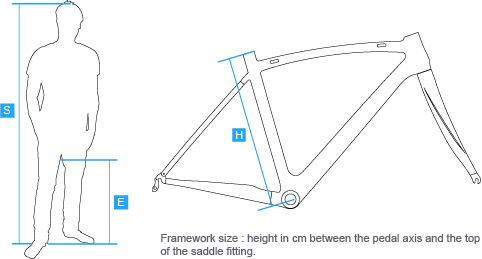 How to calculate the size of a race/road bike? How to calculate the size of an mountain bike / trekking bike ? How to measure your crotch ? Place yourself along a wall and wedge a book between your legs, in contact with the perineum. Measure the distance between the floor and the book. How to properly adjust the seat height ? Take a seat on your bike by putting your heel on the pedal, stretch your leg and tighten your saddle. Now, when you put your foot down normally, there is a slight angle with your knee. Be careful that this angle is present in rolling position.